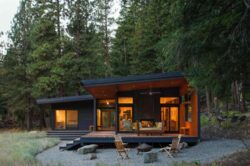 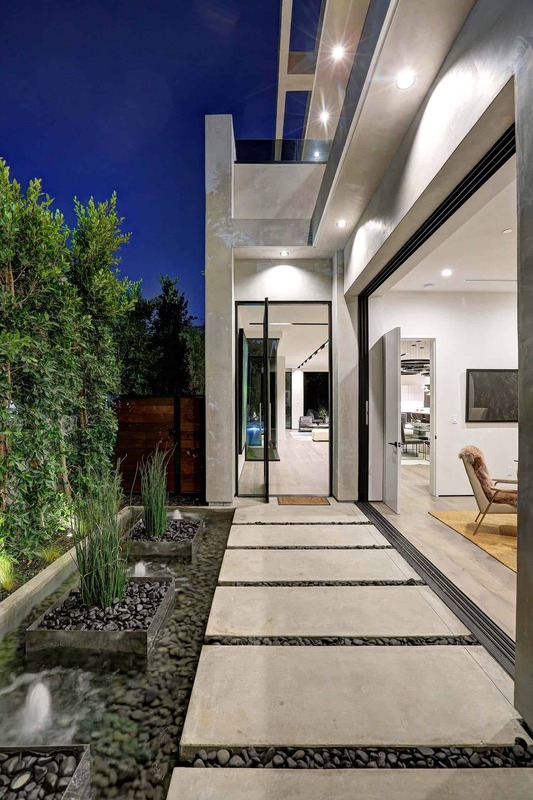 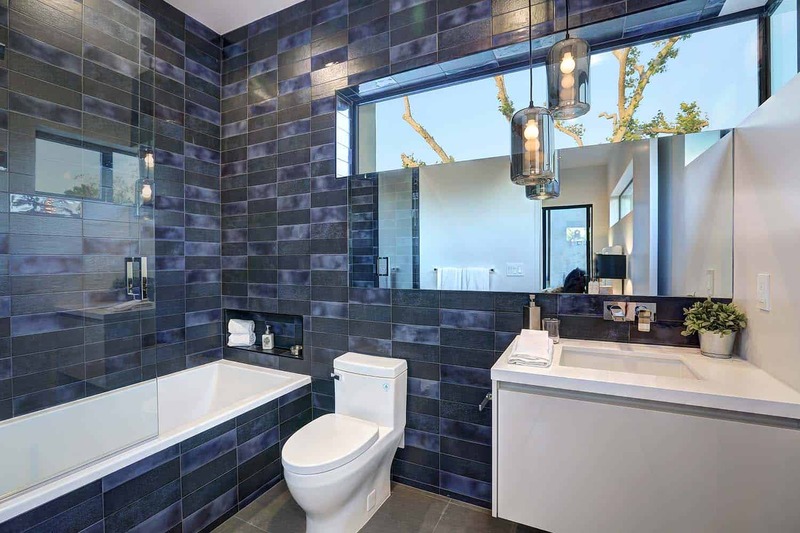 Highly regarded in their home base city of Los Angeles, California, LA Build Corp, a general contracting and real estate development firm built a phenomenal modern home that emphasizes the popularity of an indoor/outdoor lifestyle in neutral-climate cities such as LA. 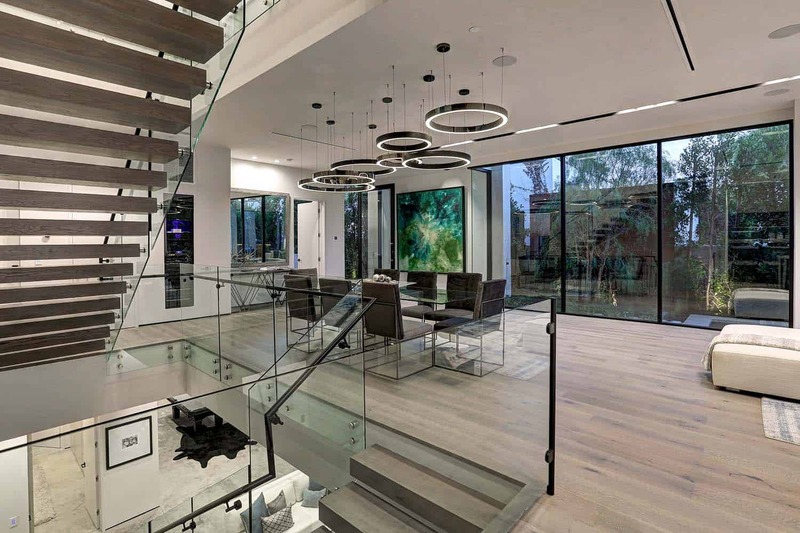 This home was originally completed as a spec home, but the developer wanted to create a unique feel to each room so every space in the home was carefully and individually planned out as if it was a custom home. 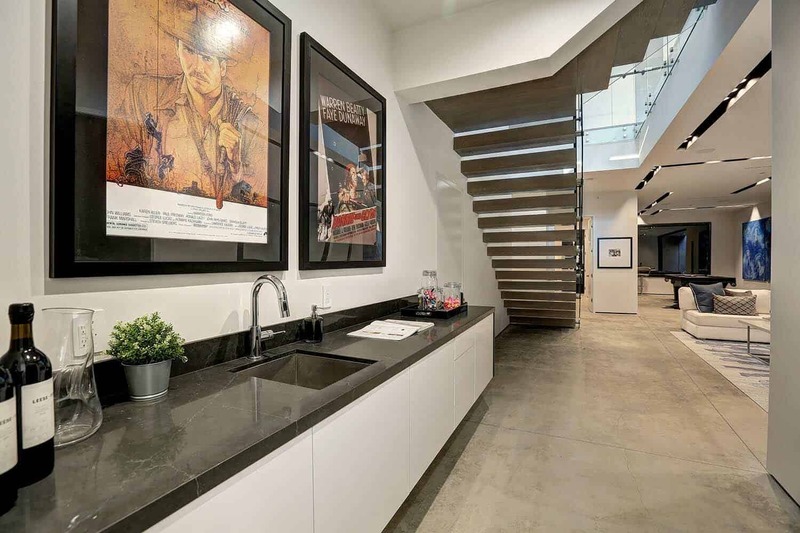 One of the most unique and interesting aspects of this home includes the addition of the basement, which LA Build Corp included, as they knew it would be an easy way to gain an extra 1,700-2,000 square feet. 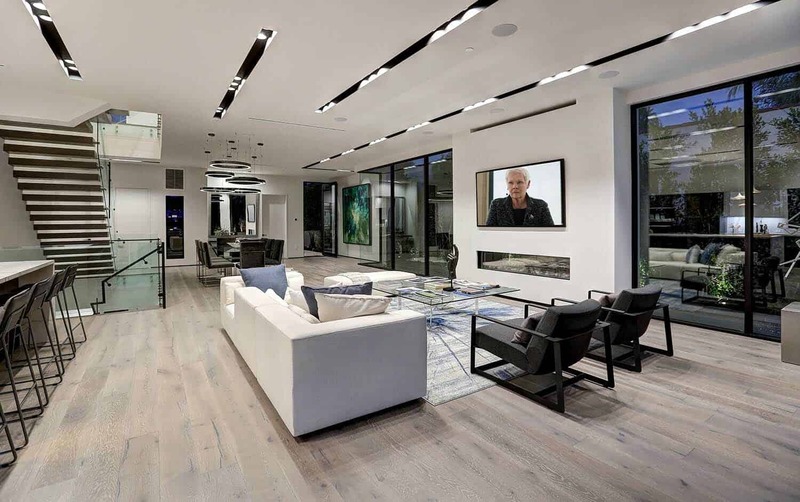 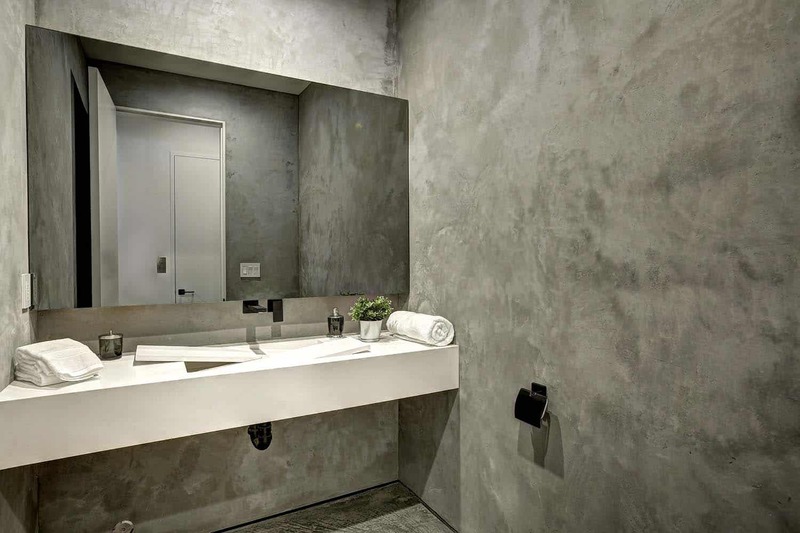 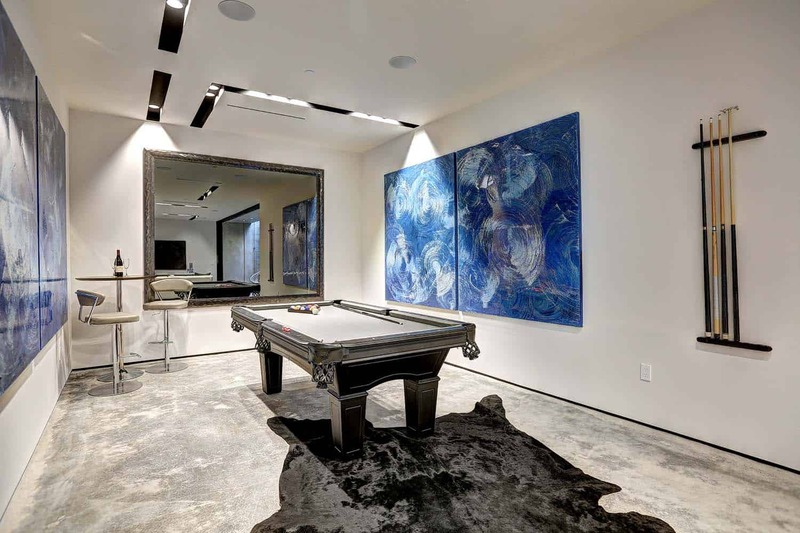 While states such as California rarely saw basements in their builds previously, LA Build Corp loves to incorporate this level to their homes, especially with the limited lot sizes allotted in large and growing cities such as Los Angeles. 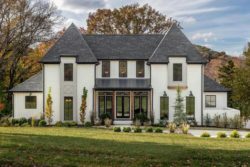 The neighborhood where this home is located is made up primarily of smaller lots, so one of the biggest challenges for the firm was to ensure they utilized the space wisely, while still leaving room for a decent backyard area. 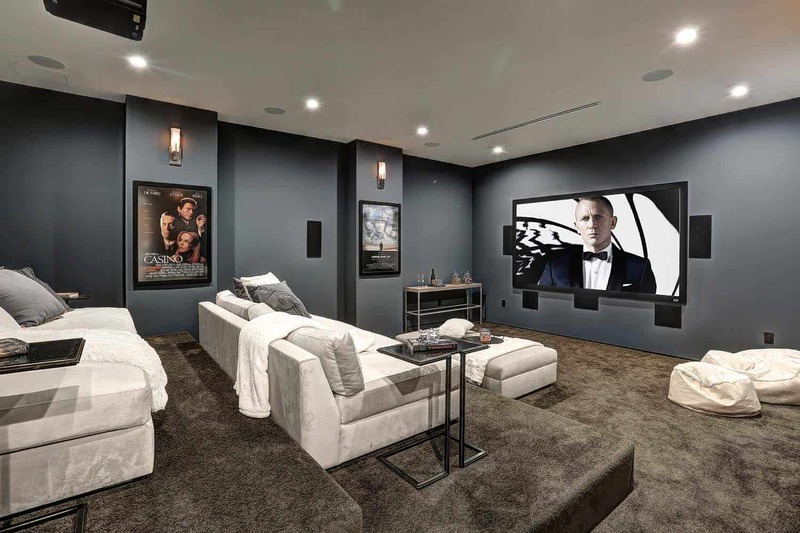 In order to really maximize the build, LA Build Corp incorporated a large basement with a common area for entertaining and then separate guest rooms, along with a spacious home theater. 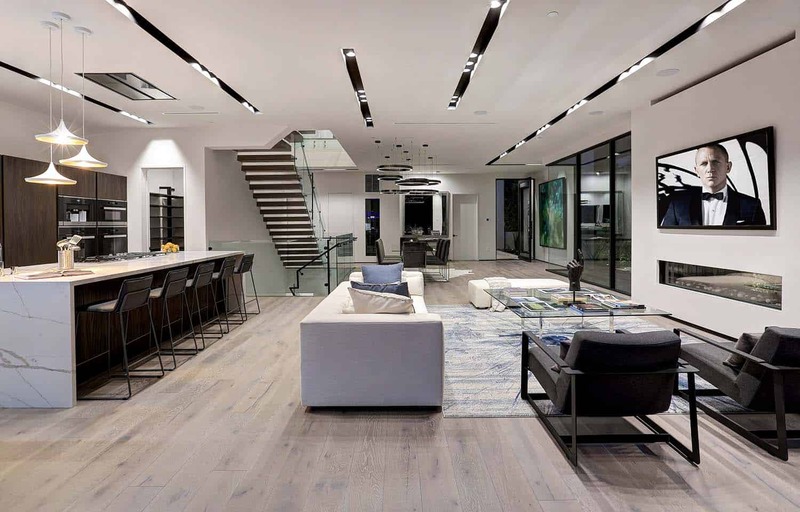 The first floor is an expansive open living space that allows breathing room for all of the additional rooms on that level including the office, living area, dining area, and kitchen. 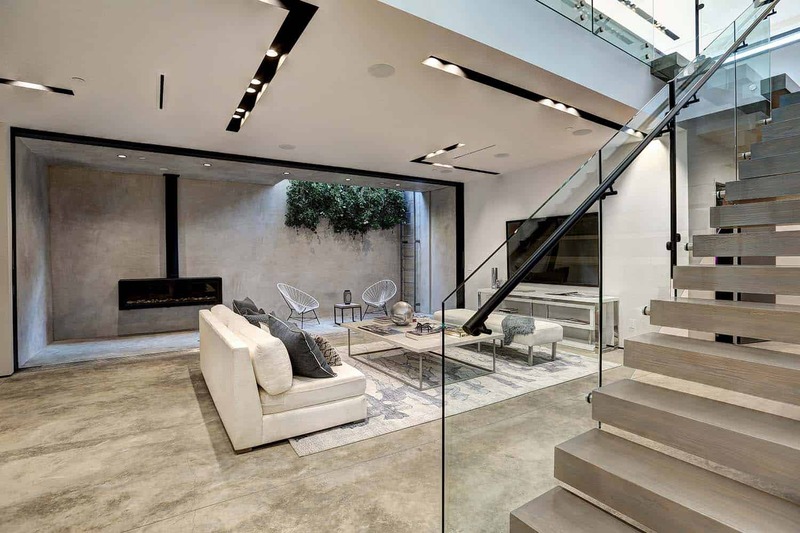 Next, the second floor includes mainly private rooms with balconies and exterior spaces surrounding the home. 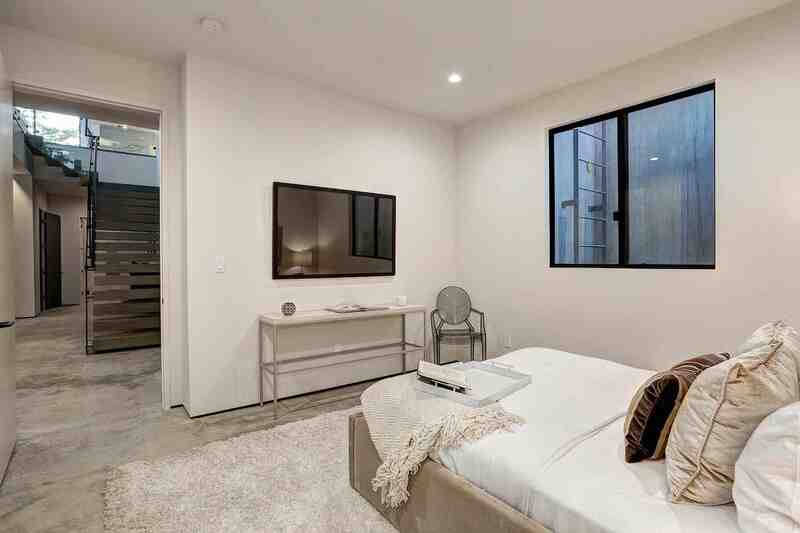 These elements really epitomize LA Build Corp’s main goal with this build – to create a home that has privacy while still allowing for all rooms to have easy access from the middle and heart of the home. 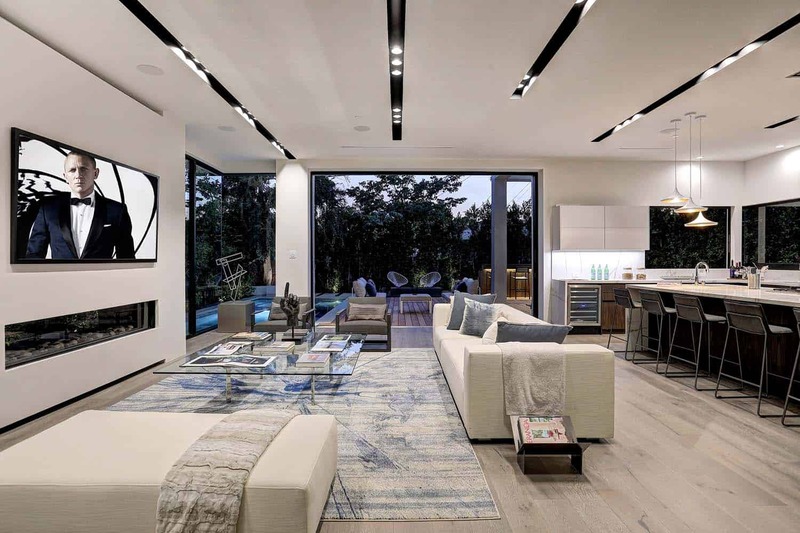 Furthermore, the firm built a variety of exterior extensions throughout the home including the office and the basement so that these spaces can have the option of feeling private when need-be while remaining expansive and inviting at the same time. 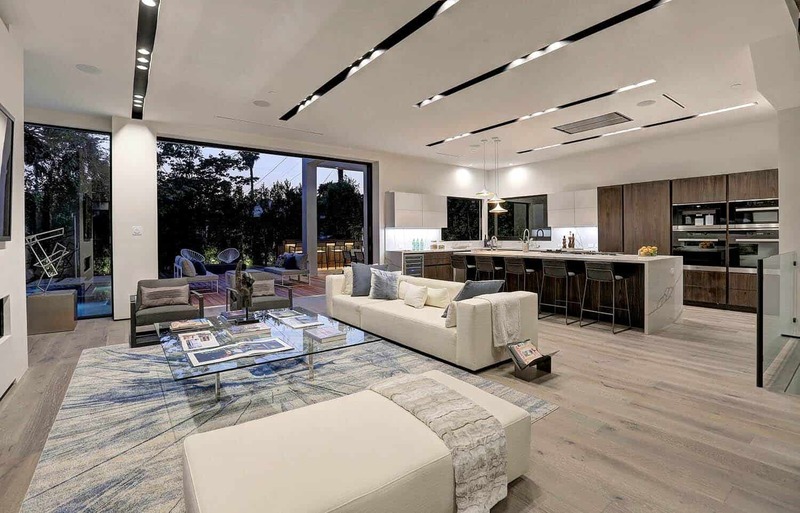 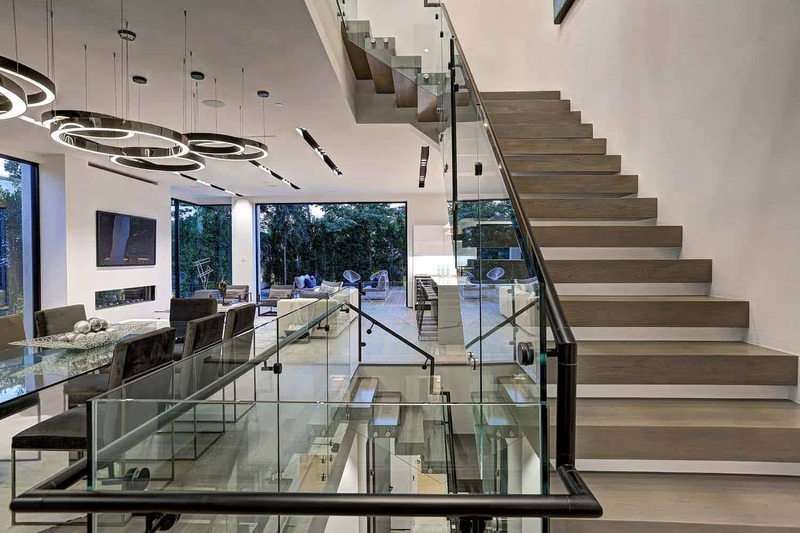 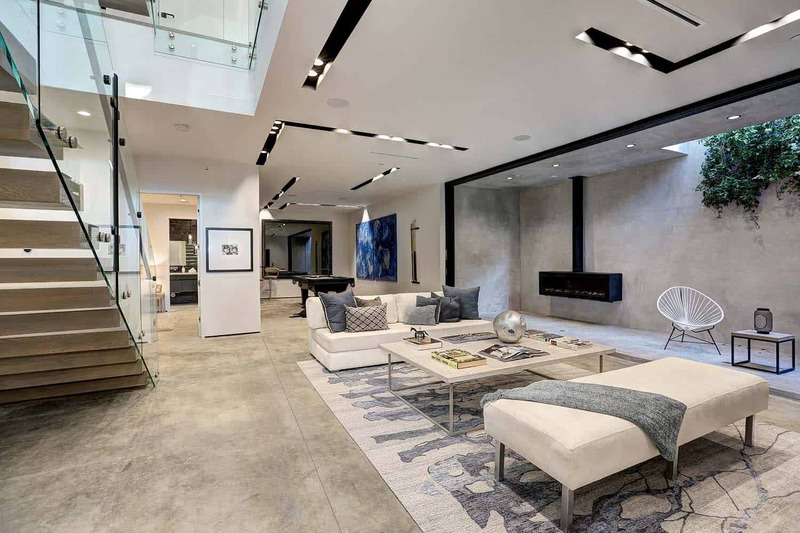 What We Love: This phenomenal modern home showcases luxurious living spaces and an extensive system of indoor- outdoor connectivity. 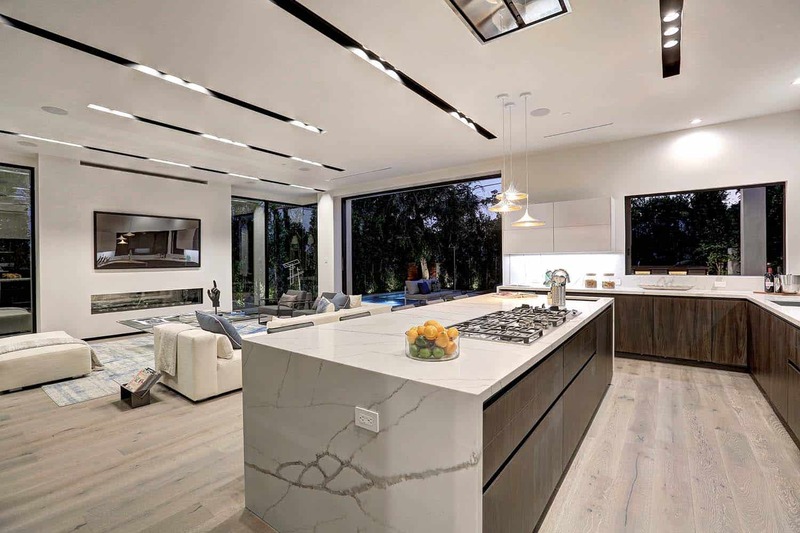 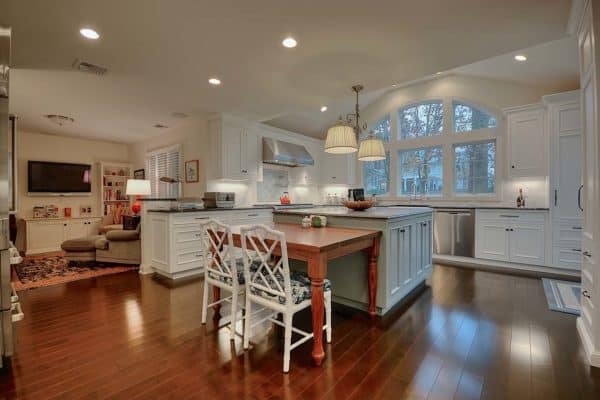 This is the perfect home for entertaining, with an open floor plan that has a fluid connection for one space to the next. 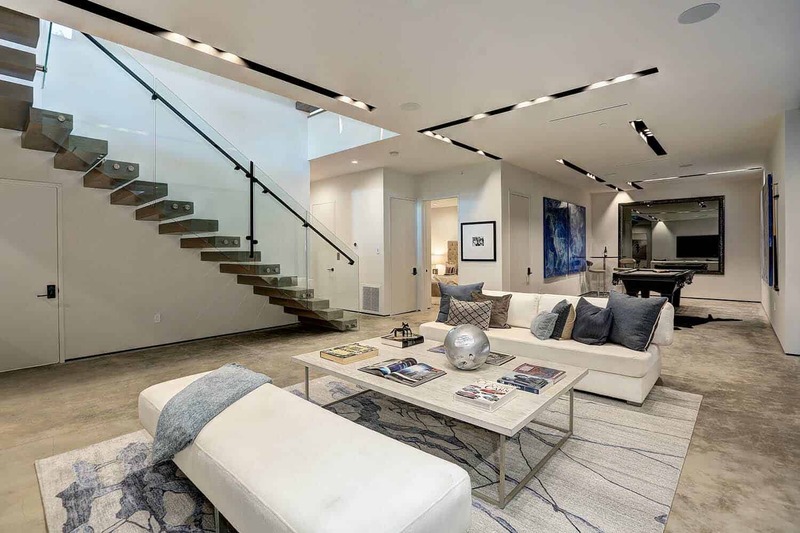 The lower level is an entertainers dream, with a spacious family room, built-in bar, game room and home theater. 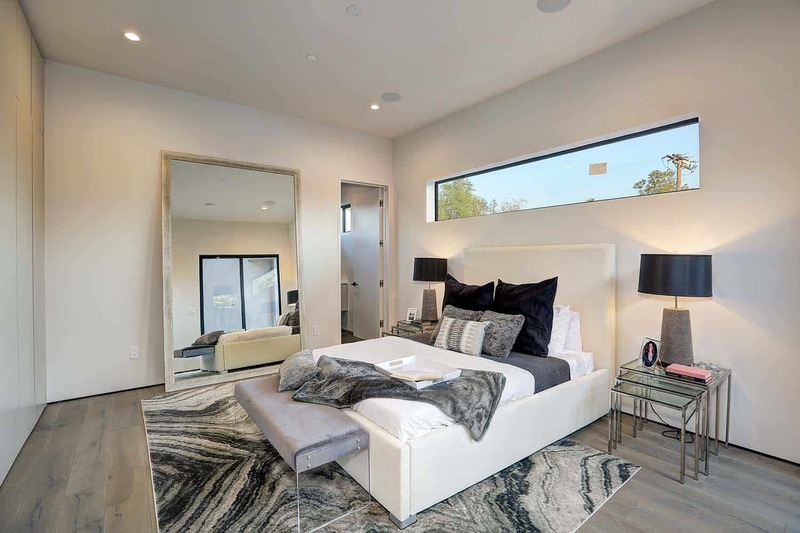 With exquisite guest bedrooms and bathrooms, your guests will never want to leave! 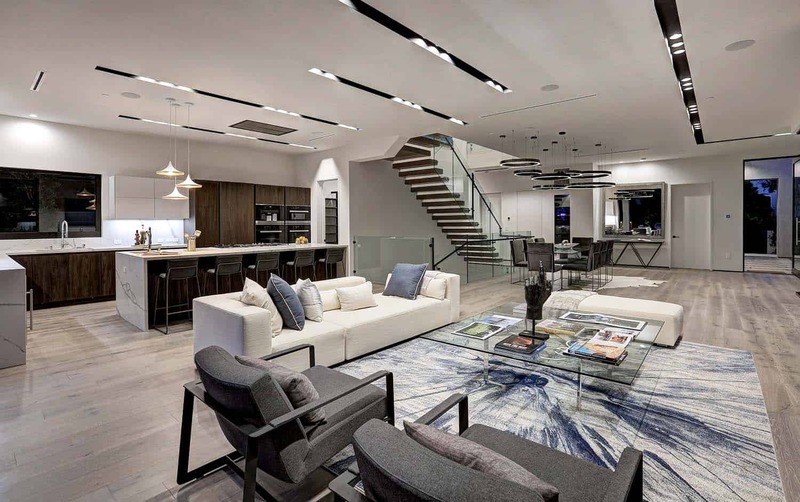 Readers, would this be your idea of a dream home? 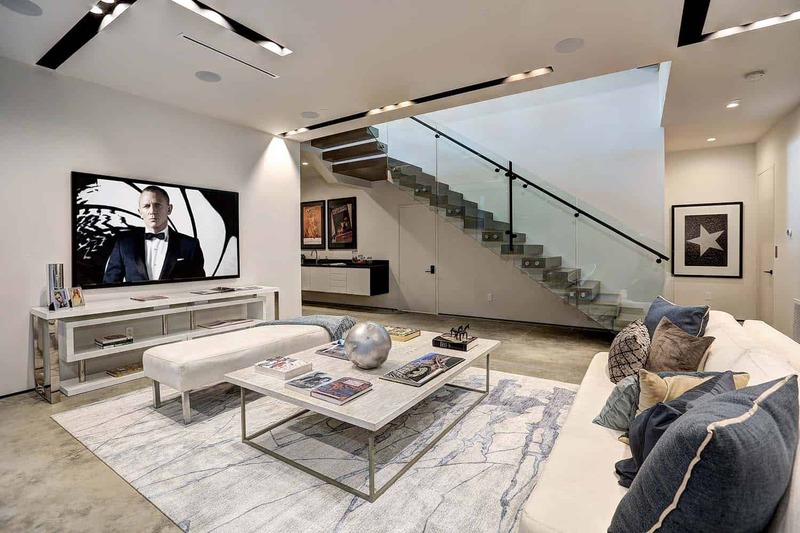 Please share with us what details in this home that caught your eye and why in the Comments below! 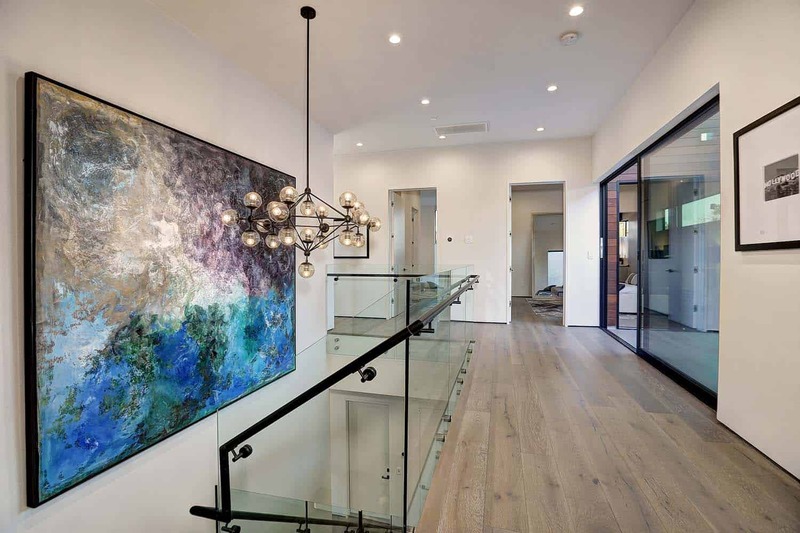 The light fixtures throughout the home are a stand-out – they are original pieces from Veneto Luce. 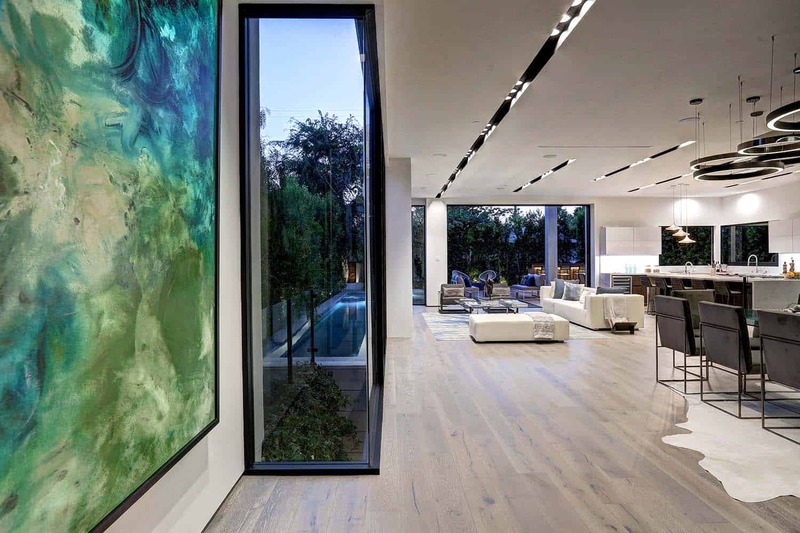 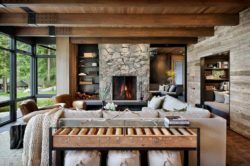 While the home wears a lot of beautiful natural light on the interior, these added details really give the space depth in the evenings. 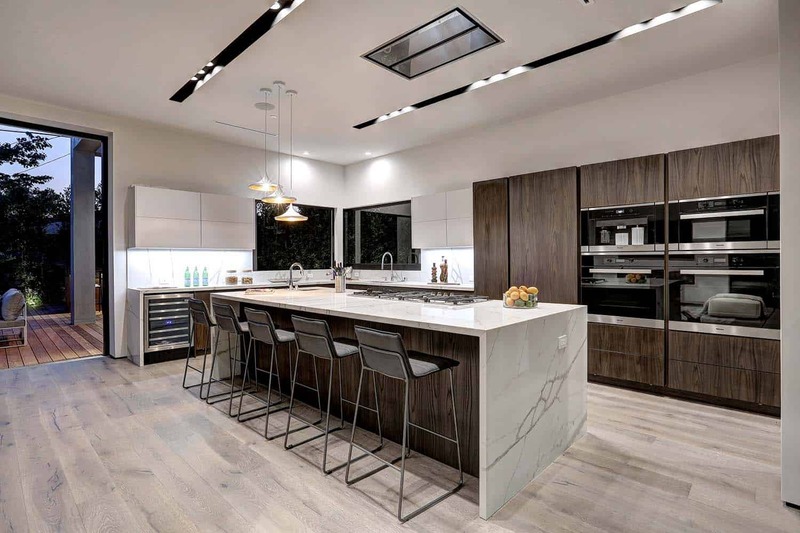 The house was designed mainly for entertaining, so there is no doubt that one of LA Build Corp’s favorite spaces in the home is the kitchen. 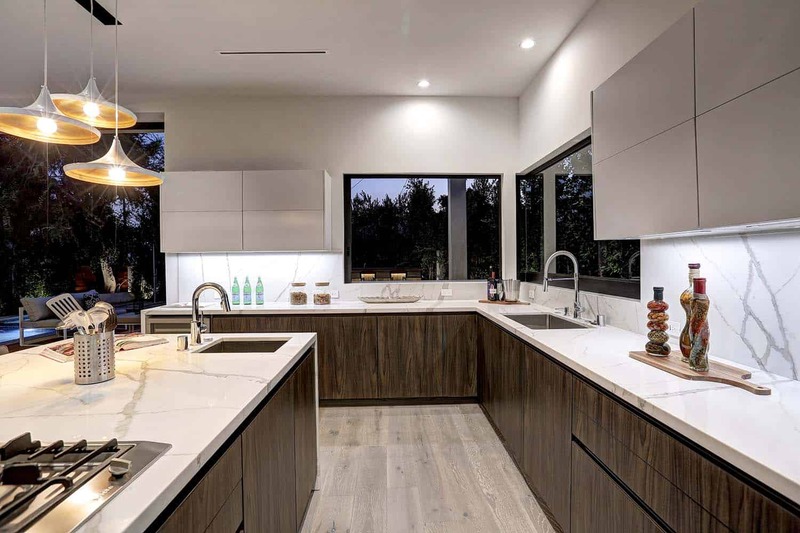 The firm incorporated double dishwashers since the area is very open and they did not want there to be the possibility of having dishes or unsightly objects sprawled across the countertops, as it would be extremely visible in the main area. 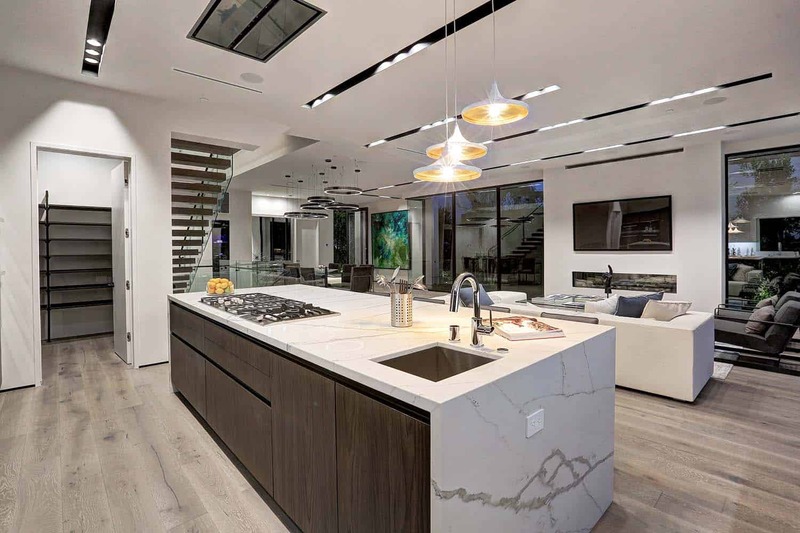 The dining area sits underneath a phenomenal grouping of unique lighting, perfect to turn on for evening ambiance. 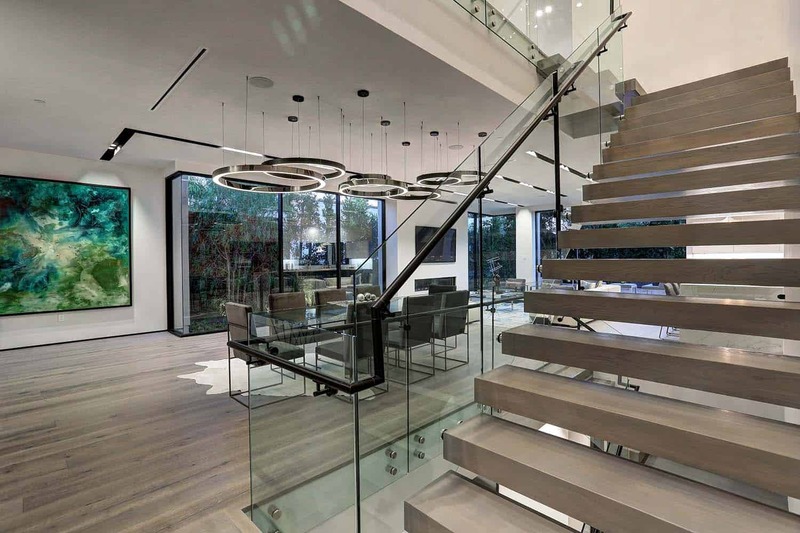 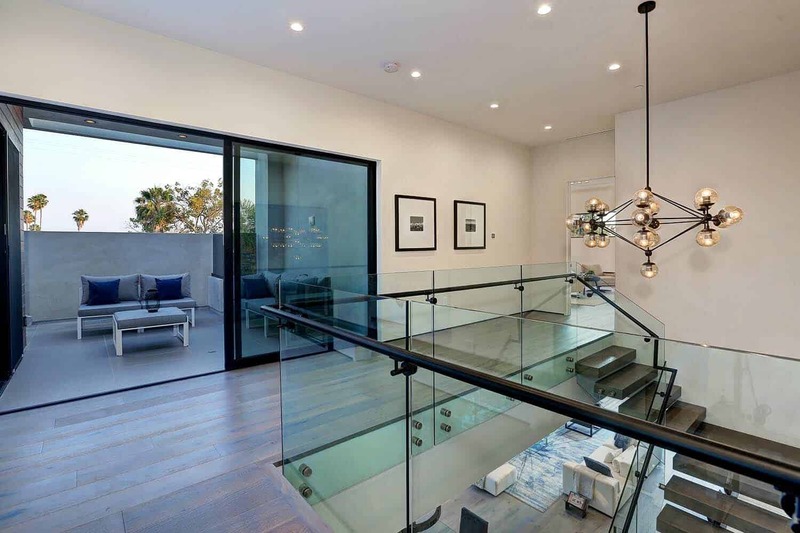 LA Build Corp built this home with the ultimate balance of modern details and luxurious space planning in mind. 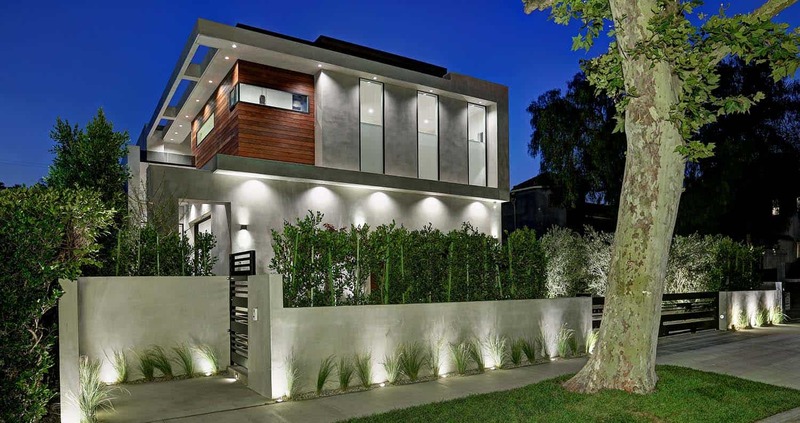 It truly epitomizes the popularity of California’s interior/exterior lifestyle. 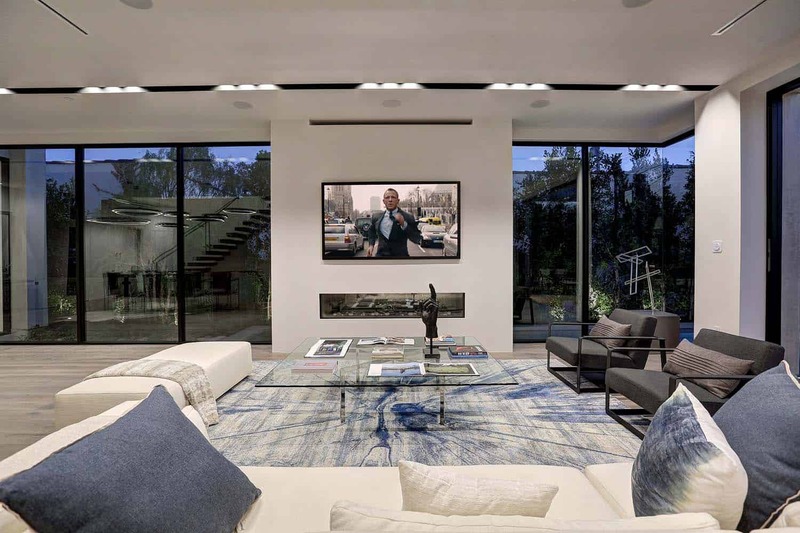 With the wide variety of spaces throughout, from the expansive lower entertainment level to the open kitchen and living area, the stunning backyard and the unique bathrooms, this home offers something for everyone and focuses heavily on the importance of home entertainment and enjoyment. 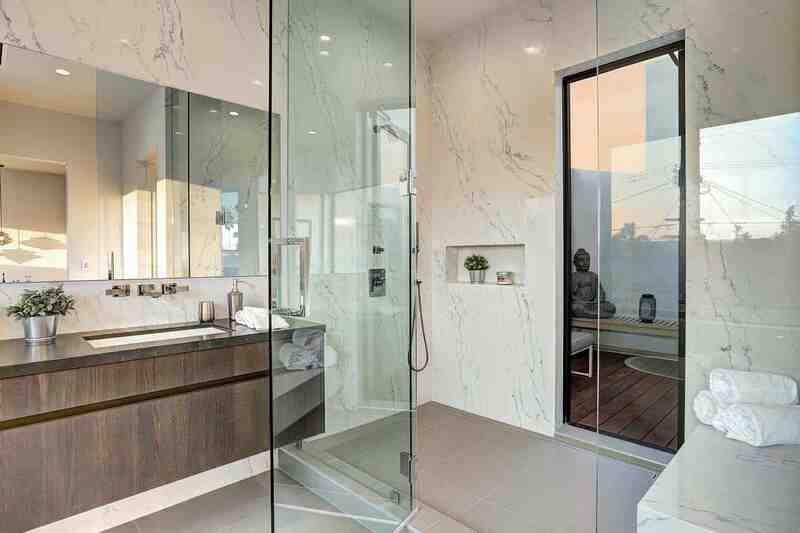 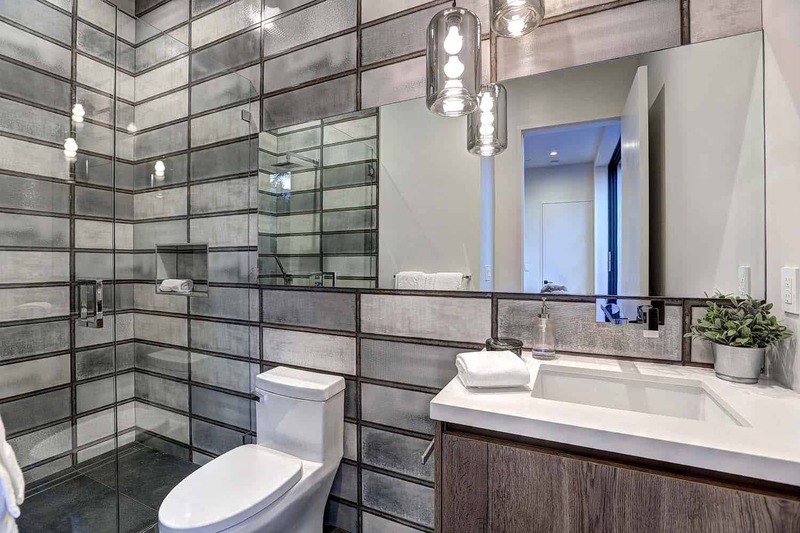 The bathrooms in this home are truly well-placed and detailed. 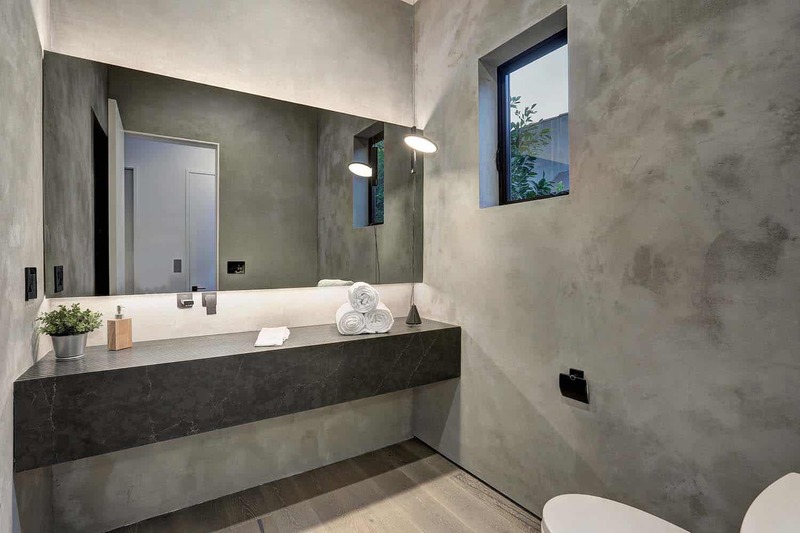 They have stunning original sinks from Jar Omar Designs, Sonobath. 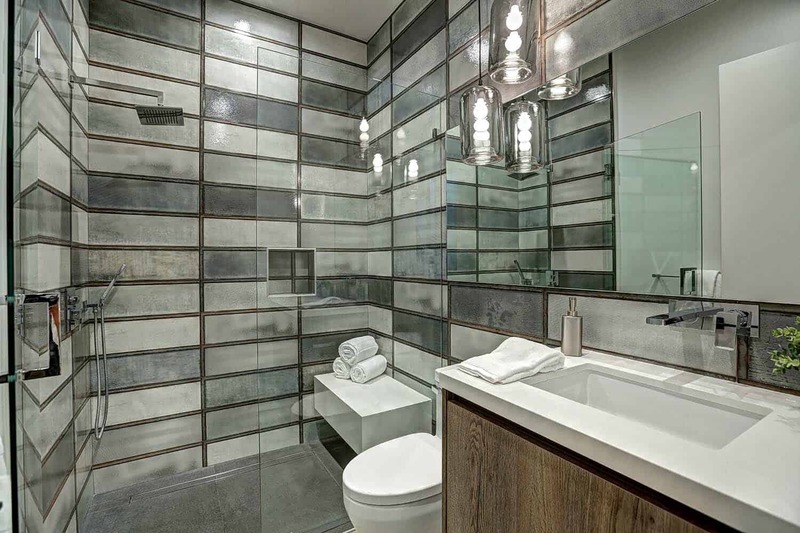 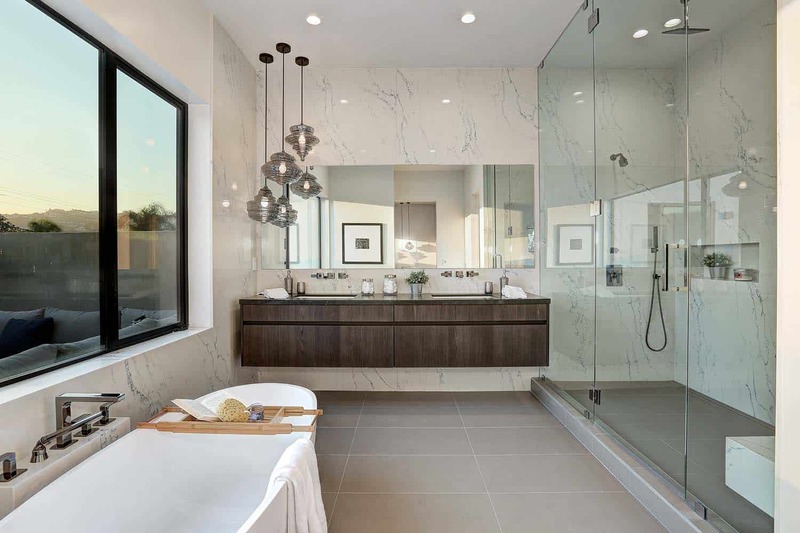 In the master bathroom, there is a variety of well-placed and highly-detailed fixtures. 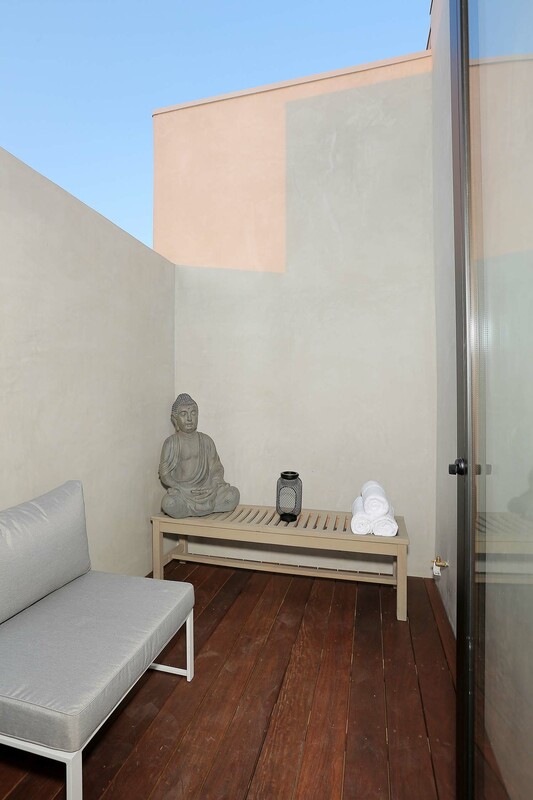 In addition, the walk-in shower has plenty of space with a bench for lounging and a separate exit out onto a private patio for yoga, sunbathing, and everything in between. 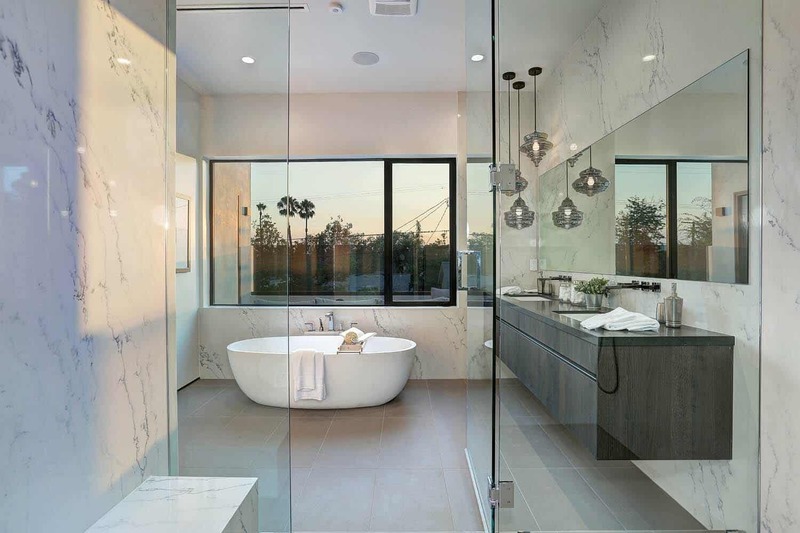 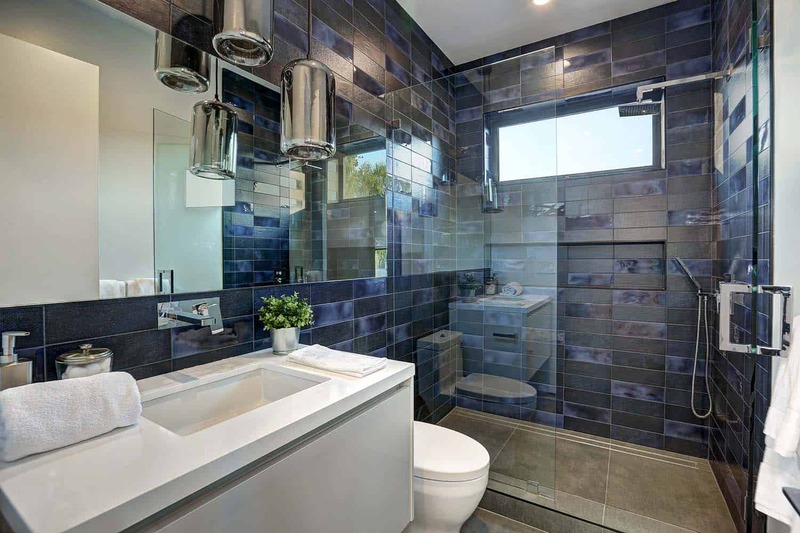 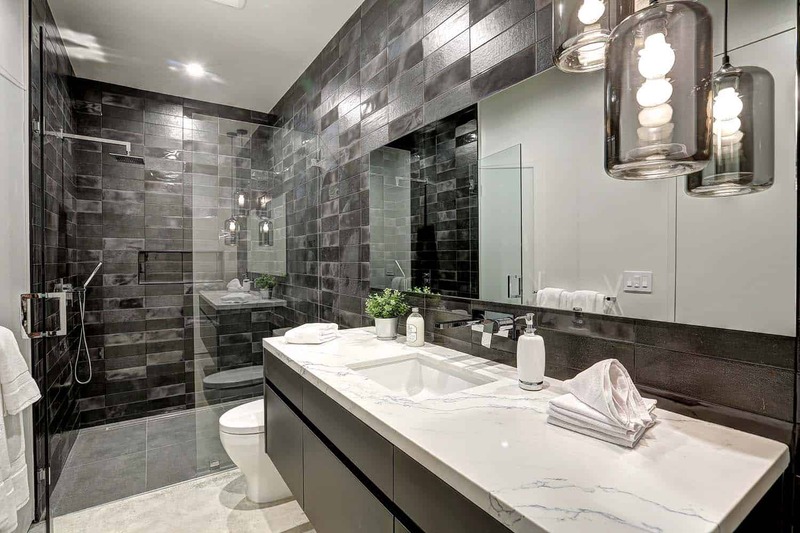 Above: The cabinets in the bathroom are floating, and in keeping with an organic theme, the free-standing tub faces the west for beautiful and relaxing morning baths. 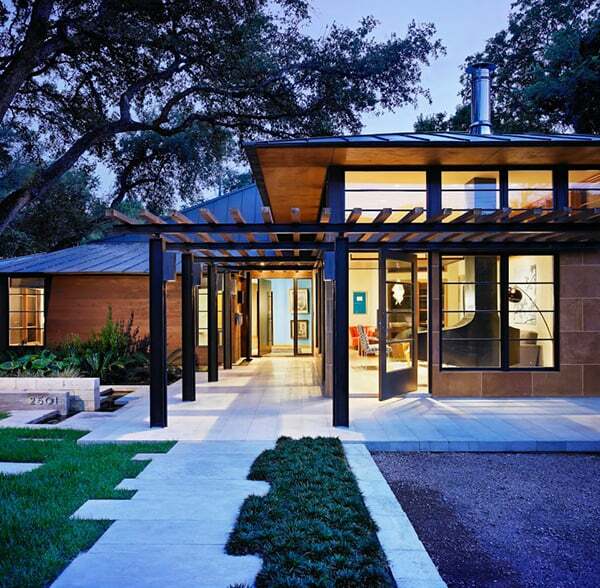 In the backyard, the firm wanted to accomplish the same balance of privacy without making the area feel too closed off. 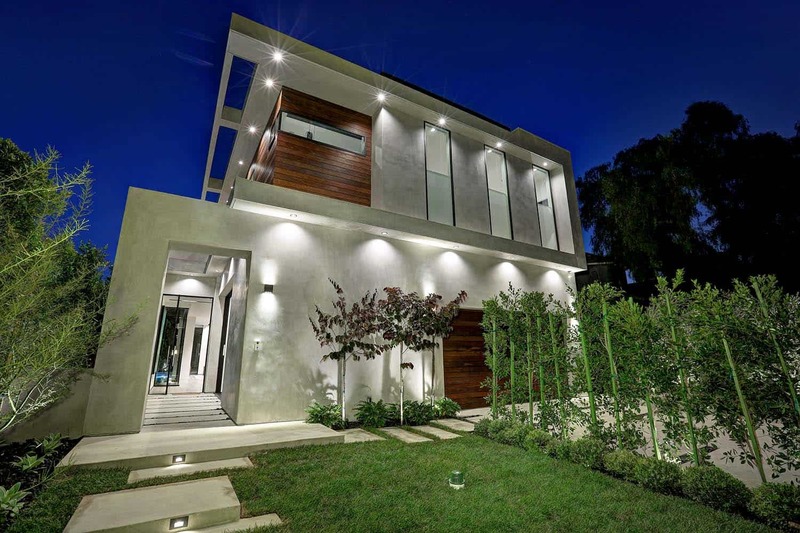 To accomplish this, they incorporated all, more mature ficus trees filled in with smaller plants in order to create a beautiful exterior contrast. 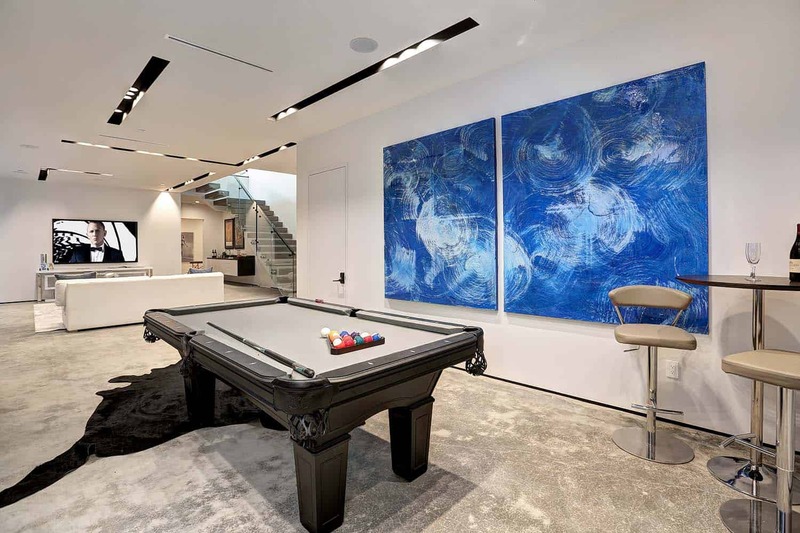 In addition, the lovely deck bleeds closely into the wrap-around pool creating a cohesive exterior space perfect for entertaining and family/friend gatherings. 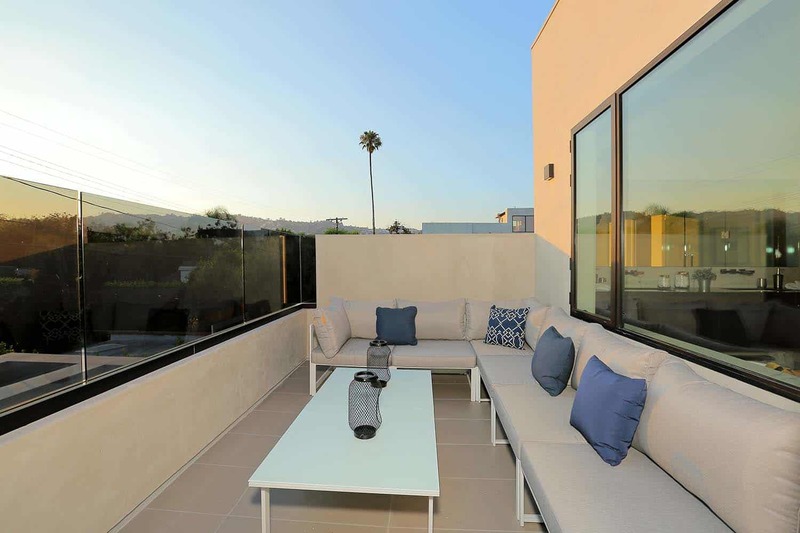 Various exterior seating areas were placed along the outdoor deck as well.